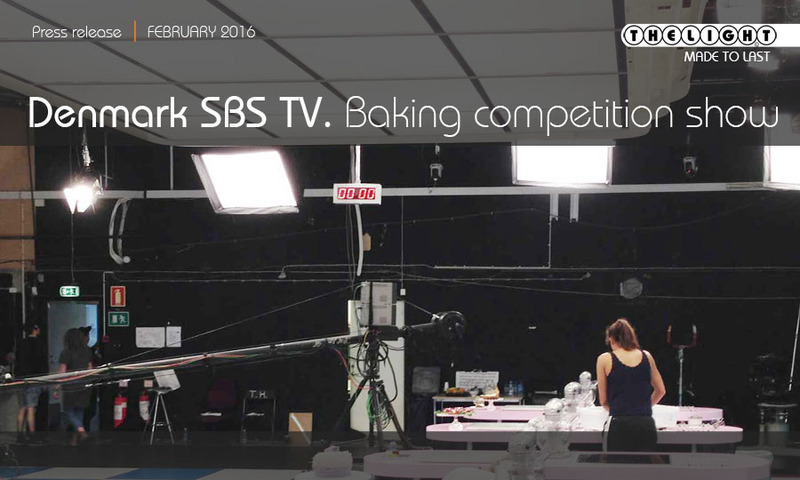 At Denmark SBS TV has made a new studio for a baking competition show and THELIGHT has been the chosen lighting provider which installation has been made by its authorized dealer Bico Professionel A/S. A very soft and natural base light has been achieved by displaying arrays of 4LONG-STUDIO fixtures overhead. The efficiency of THELIGHT fixtures produce so much light power that the light designer was able to double diffuse them even when used at 5 meter high to get a wealthy base light level for the show. The main base light has been made by lighting several 4LONG-STUDIO fixtures through the set ceiling cloth diffuser and a combination of THELIGHT and tungsten fixtures has been used as key light for the actors. THELIGHT can be easily mixed with tungsten or daylight sources thanks to the tunable colour temperature, dimmer and green/magenta correction. The full DMX remote control allows on the fly colour temperature and light intensity changes while simplified rigging and cabling make light or set changes quick. The show presenters clearly feel the difference over the old tungsten lighting: THELIGHT produce no heat light. The camera operators state “we can feel the temperature in the studio with the new LED light is lower now”.